Did you start with Day One? Gooooood. Back to business… (see, I can adult) Day Two is organized in this particular order to get maximum Rome coverage in the least amount of time. These four sites (+lunch) are relatively close to each other and you’ll actually notice a lot of people had the same plan. 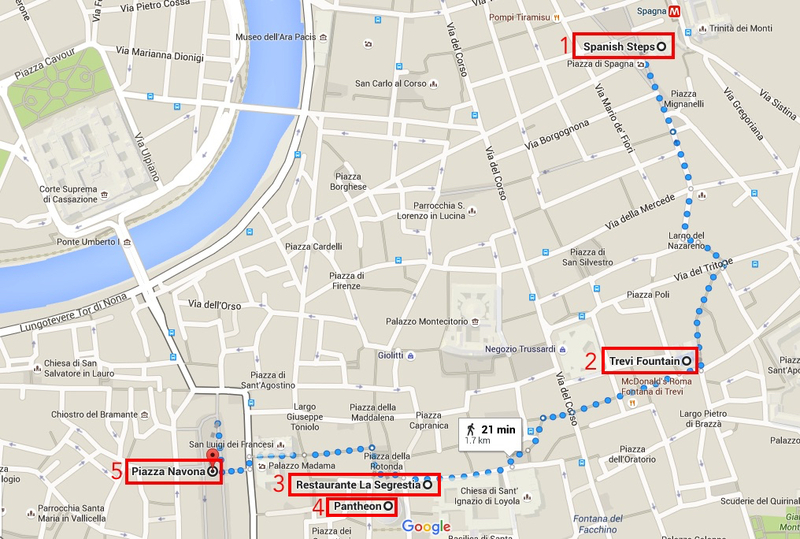 On my first trip to Rome, we did this walk in the opposite order, starting at Piazza Navona. We asked someone nearby how to get to the Pantheon and she replied, “Just-a follow the rest of the people!” And she spoke the truth. We noticed an unofficial, almost unending stream of people all headed to and from the same direction. Knocking-off someone’s well-thought-out walking tour, score! Walk to the city’s highlights yourself–no guides or transportation needed! Any day you don’t have to fight with an Italian cab driver is a good day. Spanish Steps ⇢ Trevi Fountain ⇢ Lunch ⇢ Pantheon ⇢ Piazza Navona (⇢ optional bonus at the end)! 135 steps – you can do it! They were built between 1723 and 1725 as a way to link the Spanish Embassy and the Trinità dei Monti church. They were designed by Francesco de Sanctis following a competition in 1717 EVEN THOUGH SOMEONE ELSE ACTUALLY WON. You’ll see this is a common occurrence in Italy. WHY SHOULD YOU VISIT THE SPANISH STEPS? No dress code! ⇠Something that’s kept me out of a handful of European churches. It’s a popular place that won’t take you very long to see. You need to work out those thighs if you’re ever going to make it in speedwalking. I have to laugh because, while looking up facts to give you on the Trevi Fountain, I found myself on the official website. According to this site, the Trevi Fountain is, “…the largest Baroque fountain in the city and the most beautiful in the world.” If you have spent any amount of time talking to Italians in Italy, you know why this is hilarious. To them, this is a goddamn fact. …even though Pope Clementus XII who organized the contest was a born Florentine! So much drama, Italy! What gives? I will never trust you. WHY SHOULD YOU VISIT THE TREVI FOUNTAIN? No lines! No fees! No dress code! If you throw a coin in the fountain with your right hand over your left shoulder, you’ll secure your return trip to Rome. It has worked for me thrice. See, isn’t Day Two so much easier? Well, it tastes better too. Day One lunch was spent in the back room of a mediocre restaurant sitting next to a baby that threw up on it’s mother’s shoulder. On Day Two you get to eat at La Segrestia. Located in an alley just off of Piazza della Rotunda (where the Pantheon is), La Segrestia offers some of Rome’s best pizza. The Pantheon is the best preserved building in all of ancient Rome. It was built between the years AD 118 and AD 125. To this day it boasts the world’s largest unreinforced concrete dome. It was first utilized as a pagan temple but became a Christian church in the year 609 when it was given to the Pope as a gift. Yup, that’s just a hole in the roof. Has anyone been here when it rains? WHY SHOULD YOU VISIT THE PANTHEON? The tomb of Raphael (the artist) is located inside. I kinda have a thing for visiting the tombs of dead historical figures. That’s normal, right? Finally! An ancient Roman structure that isn’t merely a bunch of old rocks! Oh, and no lines! No fees! No dress code! As I said, I started this walking tour the first time from Piazza Navona, just by coincidence I think. However, having done it in the opposite order as well, I recommend starting at the Spanish Steps and ending here. But, it’s all up to you. It’s a great place to end the day at one of the many cafés with a (couple) bottle(s) of wine. So much more beautiful at night. Piazza Navona began as another of Domitian’s stadiums (the first was pictured at Palatine Hill in Day One) and used for festivals and sporting events. It was built in the 1st century AD. …but guess what? The commission was FIRST AWARDED TO HIS RIVAL, Boromini. Italy, Italy, Italy… can someone please produce a historically accurate Baroque-period soap opera? Umm, hello Daytime Emmy buzz! Another highlight is the church of Saint Agnes. Piazza Navona has Italy’s best gelato. It’s one of Rome’s liveliest squares. You can see the head of a saint in the church. Perfect place for consuming alcohol after two days of being pushed, bumped into, sweat on, tripped, flat-tired, elbowed, and sheep-herded. Because you watched Angels and Demons like I told you to on Day One and you want to see that fountain where that… nice try, no spoilers! Ahem, I said… BEST GELATO IN ITALY. Ai Tre Tartufi kills it every damn time. I’ve eaten A LOT of gelato in Italy. The summer I lived in Italy I was deathly allergic to Tuscany and gelato was the only comfort for my severely sore throat so I ate it several times a day, wherever I could get it. First world problems? This place is DA BEST. My go-to: half pineapple, half coconut. Yes, this tour stopped at most of the sites we had already seen over our 2 days in Rome but no, it didn’t feel redundant. Visiting these sites at night is so magical because NO ONE IS THERE. They are completely deserted in the most refreshing way imaginable. After seeing what I saw at the Vatican and the Colosseum, you’d think there was never a time these sites weren’t neck deep in fanny packs. But at night, you’re the only one around. A night tour, in my opinion, is the perfect way to taper off two very busy days and the best way to butcher saying, “Arrivederci!” to Rome. ⇢ [Do you like my time-budget-travel itineraries? I’ve got plenty more coming! Visiting Rome? Find great places to stay here. What guidebook do I recommend? This one or this one, depending on your plans. Any other books I’d recommend reading before visiting Italy? Read this post. Want else have I covered in Rome? Check out these posts. ANY OTHER ROME HIGHLIGHTS YOU LOVE OR HOPE TO VISIT SOMEDAY? LET ME KNOW BELOW! I loved reading about all of the things to do in Rome in 2 days. We are heading to Rome a few days ahead of a cruise and your blog is priceless. Especially the tip about the gelato. Thank you. Thank you Lisa! And that’s perfect! You can really fit so much in, you just have to plan for it! Enjoy the gelato! I am super excited to use your tips for a short amount of time in Rome. Thanks for sharing. Awesome, thank you! Have a great time in Rome! Very indormative and detailed guide, thank you a lot! Thanks so much – glad you liked it! Have fun in Rome!